Since 1985, our goal has been to ensure the complete satisfaction of every customer or client, while offering knowledgeable and friendly service at affordable and competitive rates. 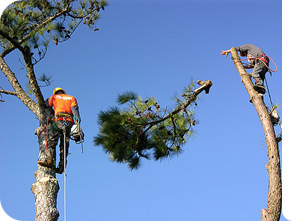 We know that you have a choice of other tree services in the area and we appreciate your consideration. Our hope is that you'll feel confident in our ability to meet all of your expectations and know that our customers are always our number one priority. We are well established and we have gained the experience of being able to provide any type of tree service that you require. However, if you don't see exactly what you're looking for here, please call us or contact us and we will do everything we can to satisfy your needs. Please take a moment to browse through our site to learn more about our company and how we can show you the MAYO'S TREE SERVICE AND LANDSCAPING. difference. knowledge and ability to properly care for trees is a benefit to their clients, their trees and the environment. The health of a tree depends on the care it receives. Quality of service depends on the care the client receives. MAYO'S TREE SERVICE & LANDSCAPING is committed to both.